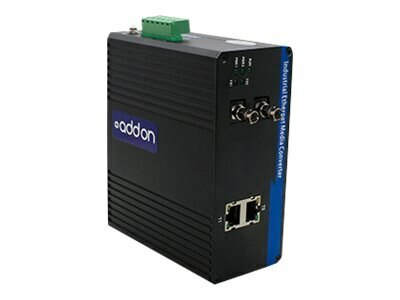 This is an industrial media converter that converts 2 10/100/1000Base-TX(RJ-45) to 2 1000Base-BXD(ST) via 1550nmTX/1310nm RX single-mode fiber (SMF) ST, with a maximum distance reach of 20km. This provides a cost effective conversion from 10/100/1000Base-TX(RJ-45) to 1000Base-BXD fiber, while extending the network reach beyond the 100m reach limitation of copper. This industrial grade product includes a terminal block and does not come with a power plug. Our media converters and network interface cards are 100% compliant for all of our networking needs. Now you have a cost effective solution to your network upgrade needs.